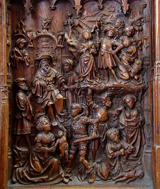 Oak woodcarving in the choirstall area of the Cathedral of Amiens, 1507-1522. This brutal scene shows the biblical Massacre of the Innocents. Massacre of the Innocents, from Art in the Christian Tradition, a project of the Vanderbilt Divinity Library, Nashville, TN. http://diglib.library.vanderbilt.edu/act-imagelink.pl?RC=51551 [retrieved April 23, 2019]. Original source: Collection of Anne Richardson Womack.